“Despite the vicious opposition the civil rights movement endured, despite the ongoing violence we see from Ferguson to Charleston to Pittsburgh and abroad, James Lawson has remained steadfast in his commitment to nonviolence as both a political tactic and a moral calling,” said Chancellor Block on Nov. 28 to an audience of several hundred people. The crowd gathered in Carnesale Commons included Lawson’s wife, Dorothy, and their sons; California State Sen. Maria Elena Durazo and L.A. County Supervisor Mark Ridley-Thomas, who both spoke as part of the program; members of Holman United Methodist Church, where Lawson served as pastor; members of the labor community; and UCLA labor studies students, many of whom have taken Lawson’s wildly popular class on non-violence and social movements, which Lawson has taught since 2003. Read more on UCLA Newsroom. Abel Valenzuela, professor of Chicano studies and urban planning and director of UCLA’s Institute for Research on Labor and Employment; Mark Ridley-Thomas, Los Angeles County supervisor; Kent Wong, director of the UCLA Labor Center; the Rev. 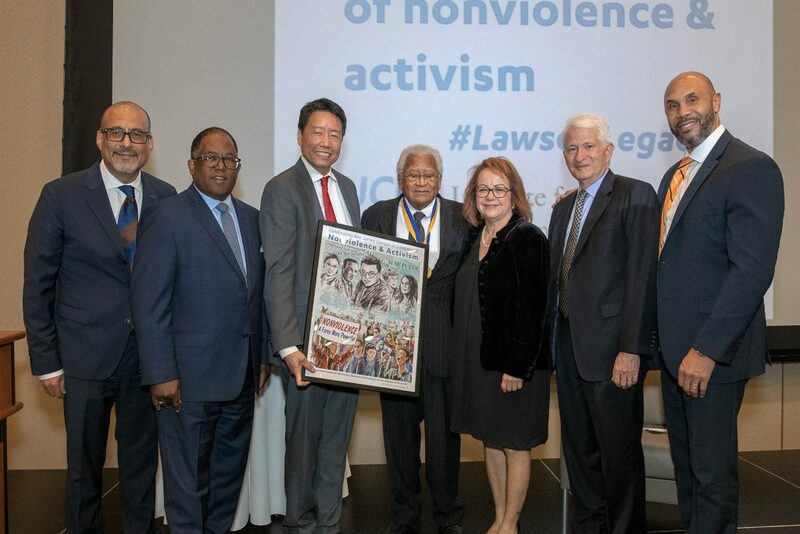 James Lawson; California State Sen. Maria Elena Durazo; UCLA Chancellor Gene Block; Darnell Hunt, dean of the division of social sciences in the UCLA College.